Pioneering stand-up Charlie Williams, who found fame on hit 1970s TV show The Comedians, has died at the age of 78. 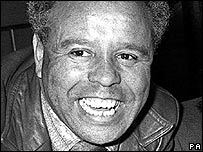 Born in Yorkshire of Jamaican descent, Williams was the first black comedian to make the big time on British TV. He played professional football for Doncaster Rovers before developing the comedy catchphrase "me old flower". Williams, who had been ill for some time with Parkinson's disease and dementia, died at Barnsley General hospital on Saturday afternoon. Williams's biographer Stephen Smith told the BBC News website the comedian was an "innovator" and a "trailblazer". "He opened the door for black performers to be accepted everywhere," he said. Williams found his talent for comedy at school, where he said he could either deal with racial prejudice by fighting or making people laugh. He chose the latter, saying: "I never liked soiling my clothes." Mr Smith added: "So he made everybody laugh and in doing so became a household name." After leaving school, Williams worked at Upton Colliery, where he was spotted playing for the football team and became a centre-half at Doncaster, making 171 appearances for the club in the 1950s. He later moved into showbusiness as a singer but his talent proved to be in comedy, and he often poked fun at race issues. Others he appeared with on Granada's The Comedians, which started in 1971, included Frank Carson, Bernard Manning, Tom O'Connor, Jim Bowen, Lennie Bennett and Mike Reid. He went on to host the Golden Shot game show in the mid-1970s and other black entertainers such as Lenny Henry and Gary Wilmot later cited him as an inspiration. In 1999, Williams was made an MBE for his charity work. He was also voted Doncaster Rovers' all-time cult hero by viewers of the BBC's Football Focus programme. He had been suffering from Parkinson's disease for more than a decade, Mr Smith said.